Organic, Vegan, Gluten-free Brownie based on brown pea and fava bean proteins. This delicious recipe was developed in the Aloja Starkelsen test kitchen to demonstrate the functionality of the Brown Pea and Fava Bean proteins and flours. It was tested in a home kitchen setting by our export manager Erkki, who is an agronomist, organic advocate and sales man – so by no means a professional in the kitchen. This is the first in a series of recipes we will post in this blog – stay tuned! The best way is to subscribe to this blog on the upper right side of this page. In the photo captions you can read how Erkki succeeded with the recipe. Some further ideas after the photos. First I mixed all the dry materials (brown pea and fava bean proteins and flours, sugar and baking powder) in the bowl before adding the cold water. Thereby I tried to avoid lumping of the finer powders, especially the protein which is very fine. I used the organic baking powder produced by Aloja Starkelsen which contains organic potato starch as functional carrier. I added the flour mix to the cold water mixing all the time still trying to avoid any lumping. At the same time I put the organic dark chocolates in a kettle and warmed them up so they melted. 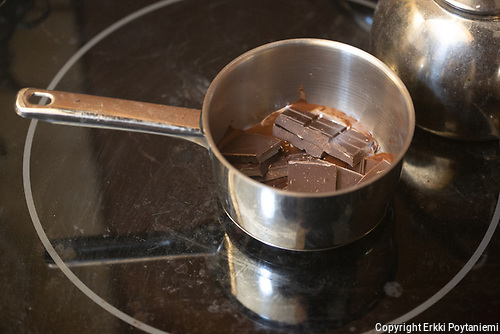 Be careful when melting chocolate – don’t use any more heat than necessary. On our wood heated stove it is easy to find the spot with a suitable temperature. It’s good to have a thermometer to control the heating of the flour-water mix. When the mix gets over 60C and approaches 80C it gets thicker as the protein globules open up and starch creates viscosity. 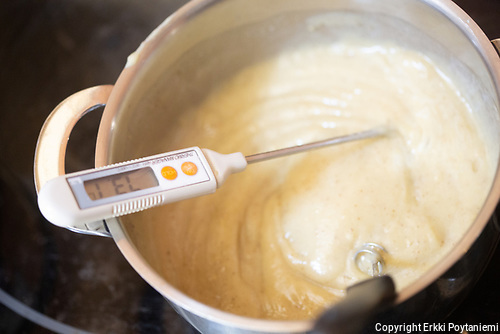 If you don’t have a thermometer just follow the thickening of the liquid and don’t let it boil at any point. 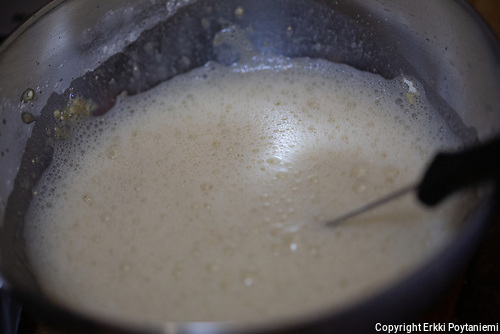 At 80C it is already too thick for a whisk so mixing with a spoon works better. After I had reached approximately 80C I mixed in the melted chocolate. The dough is ready. 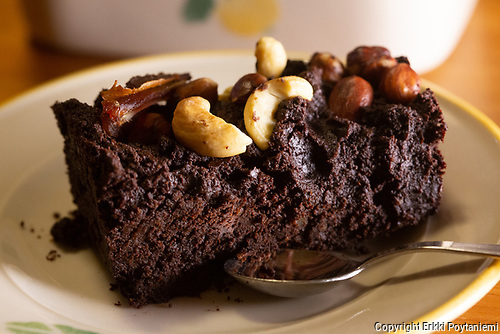 If you want to prepare a Brownie cake for several people you might want to double the recipe. I used a ‘Pentik’ butter case in lack of any suitable small enough cake pan. You want to have some thickness in the Brownie. 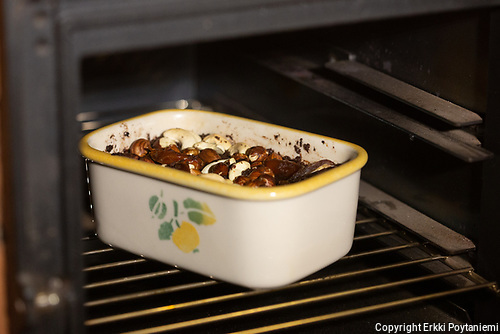 Here I am using our wood heated stove oven which I managed to heat pretty much to 180 C.
I found some hazelnuts, cashew nuts and dates in our cupboard with I spread on top of the Brownie. I was quite happy with the result and the taste is delicious. So here you have an organic, vegan and gluten-free brownie – fulfilling several top trends of today – that tastes delicious. 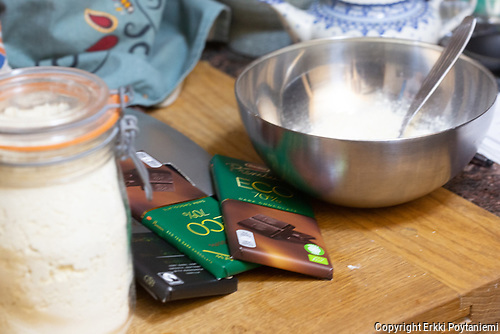 I calculated that it also contains 13 g of protein per 100 g.
If you compare this recipe with a more standard brownie recipe, you can see that what we did was to replace eggs with brown pea protein and to replace wheat flour with pea and fava bean flour. 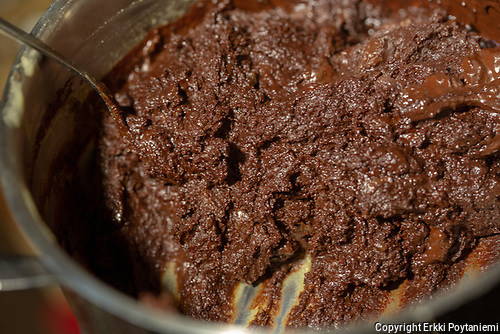 If you would like to make a vegan brownie but don’t mind wheat, you could just use pea protein instead of eggs and use wheat flour as in a standard recipe. Or if you would like a gluten-free muffins but don’t mind eggs, you could just replace the wheat flour with brown pea and fava bean flour. The purpose of using both brown pea and fava bean proteins and flours is to mask the taste of both but with that amount of dark chocolate it might not be a problem anyway. If you have questions or would like to comment you can do it on our Facebook page or drop us an email.